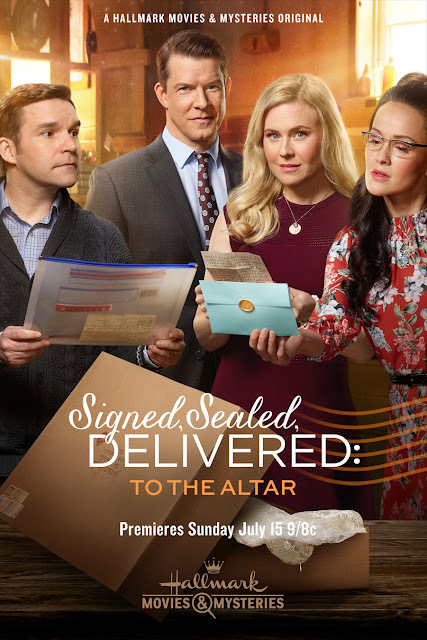 This is the ideal Summer weekend to keep cool inside and watch Christmas in July movies all weekend long... leading up to Hallmark Movies & Mysteries premiere of "Signed, Sealed, Delivered: To the Altar." 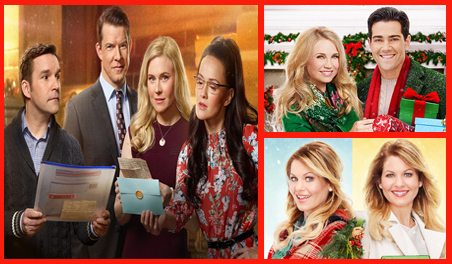 This Saturday and Sunday you can enjoy Christmas movies on both the Hallmark Channel and Hallmark Movies & Mysteries! 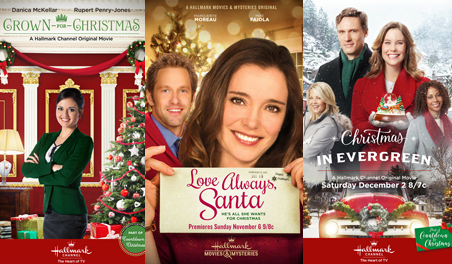 Whatever you choose, it's the best of lighthearted holiday romances and seasonal dramas! CHRISTMAS in JULY MOVIE SCHEDULE! Alameda & Downing - Insightful reviews, behind the scenes details, and much more devoted to "Signed, Sealed, Delivered"
Mark Her Words - 25 reasons To Watch "Signed, Sealed, Delivered"
I hope you all have a wonderful weekend... may it be Merry and (sunny) Bright - as you fill it with cheerful Christmas movies and special Summer memories! It seems we have waited so long for this next "Signed, Sealed, Delivered" movie to come... I can hardly believe it's almost here! Seeing Oliver, Shane, Rita, and Norman again... will be like a visit with dear friends! How sweet I'm anticipating it will be to see dear Norman and Rita exchange their wedding vows, even if Ramon is officiating! I can't wait until we are all seated and watching together! 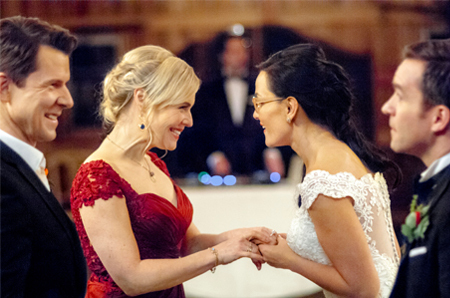 I am so grateful to all the POstables who are so supportive of this most incredible mystery series... it was, indeed, a "divine delivery" in all of our lives! Thanks for linking to my site.....I love that our Hallmark community of bloggers & podcasters continues to support each other, as well as the great content we view. As always, great work, Net! I've been counting down the hours and minutes until the new SSD tonight. I can hardly believe Norman and Rita are finally tying the knot. It hardly seems fair if Hallmark doesn't give us a wedding for Oliver and Shane after this. I know I'd be heartbroken. But I'm going to love every minute of the show tonight. I'm not loosing hope that they will be back. What a great weekend! All my favorite Christmas movies and new SSD! Somebody pinch me! I sure hope they announce more Signed Sealed Delivered movies at the TCA party. I've heard some of the POstables are going, so maybe that's a clue. I'm clinging to any hope I can find here. Signed, Sealed, Delivered is one of those rare movies that you drop everything to watch because it is something special, no other show is quite like it, nothing else on TV comes close to compare. If Hallmark is as smart as I think they are, I believe they won't less this series go. Thanks for posting all those links, Net. I had no idea all the main cast did interviews. I don't know if any of you have directv, but as of this AM, it is still showing I Love Lucy and Golden girls on the guide even though Christmas movies are on. and it shows The MIddle on at night, I am hoping I am able to record movies or the directv guide will update soon. Anyone else have this issue too, with Directv? Yes! I noticed this, too, Sabrina, late last night... and I thought at first - oh, dear... they didn't change it again, did they? So, I quickly checked Hallmark's site for their schedule and thankfully, they were all there. I noticed DirecTV's schedule is still off today. The website is correct now, but this AM I checked before I left and it was still saying Golden Girls while Matchmaker Santa was on, so hopefully when I go home it will be fixed, I may have to rest it, but our power goes out on a regular basis with the afternoon storms, so it may do it for me before I get home. I needed to rerecord A Very Merry Mix up, and I had to record A December Bride to get Very Merry Mix up, that will be a funny thing in a year when I am looking thru all my recordings. I almost tried to record all the Golden Girls from 8 to 10 this AM to see if the movie will be broken in 4 spots but I thought I would call Directv today, but the website guide is fixed so maybe I will have a happy surprise when I get home. The SSD movie was fantastic! My husband and I enjoyed it so much. Unfortunately, it seemed as though they were wrapping up the story of The Postables. We would love to see more of them! Susan, I'm so glad you & your husband thoroughly enjoyed SSD: To the Altar. It was so beautifully done, with all the flashbacks and everything... I agree with you... It did sort of seem like a possible end, but I'm still hoping there will be even more divine deliveries for our POstables! Sad but pleasing series finale for SSD. We got eleven one hour episodes followed by eleven two hour episodes. It's great that they've kept the cast together for that long and that we've been fortunate to have such a wonderful show to watch and re-watch since it started 5 years ago. But sometimes it's best to go out on top.